Note: A state that opts out of the FirstNet build plan needs to provide its own Radio Access Network or RAN. That is, the cell sites that will connect to the FirstNet backend or Evolved Packet Core (EPC), which is the brains of the network. I plan to file comments and I suggest any state even considering opting out at least read this document very closely. If comments are appropriate, that state should file before the deadline. I would never suggest to any state that it opt out, rather my thought is to work with FirstNet and the partner and accept the coverage being offered, perhaps with some suggested modifications. Also, make sure your state has the right to negotiate with the partner so after building the RAN in the state there will be ways to expand coverage of the network. The First Responder Network Authority (FirstNet) plans to hold a southwest border forum Aug. 30-31 in Phoenix, Chris Algiere, FirstNet’s federal consultation lead, said in a blog posting. “The U.S. southern border continues to be one of the largest challenges for public safety operations at all levels of government. The dynamic mission space, coupled with the remote landscape and environmental factors, challenges technology delivery of just about any sort,” Mr. Algiere said. “As part of our consultation and planning for the nationwide public safety broadband network, FirstNet is holding a federal forum focused on operations along the southwest border of the United States and has plans for future forums in other regions of the U.S. The upcoming southwest border forum is part of our plan to take consultation with federal departments and agencies beyond the headquarters and engage management, practitioners, and other staff members across the United States,” he stressed. “The Forum will be held in Phoenix, Arizona August 30th and 31st at the Bureau of Land Management’s National Training Center. This meeting will provide an opportunity for federal stakeholders in and around the southwest border region to engage with FirstNet through a series of presentations and breakout sessions focused on understanding the needs and challenges facing federal practitioners and what is possible with public safety broadband,” Mr. Algiere added. The Federal Emergency Management Agency (FEMA) U.S. Fire Administration (USFA) released a new guide on radio communications for the fire service. 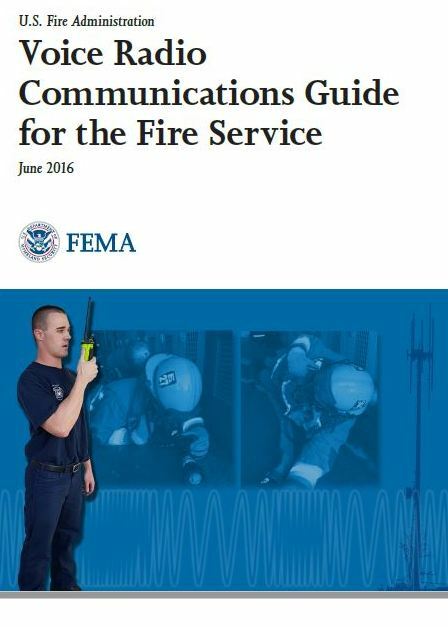 The Voice Radio Communications Guide for the Fire Service comprises 10 sections covering basic radio technology, digital and analog technology, conventional and trunked radio systems, portable radios, system design and implementation, interoperability and spectrum licensing, and future technology convergence with FirstNet. Communications on the fireground are fast-paced and may be chaotic. Work position. Firefighters are often on the floor crawling. Visibility challenges including heavy smoke and dark situations. SCBAs pose several challenges: Voice ports on facepieces are difficult to communicate through and restrict field of vision. Gloves and other personal protective equipment (PPE) restrict vision, hearing, and the manual dexterity required to operate radio controls. Buildings vary greatly in construction and complexity. All buildings to some degree resist penetration of radio waves. The USFA worked with labor union International Association of Fire Fighters (IAFF) to develop the guide. The U.S. Department of Homeland Security (DHS), Science and Technology Directorate (S&T), First Responders Group, Office for Interoperability and Compatibility (OIC) supported the partnership. July 19, 2016–The National Telecommunications and Information Administration today released a public notice providing preliminary guidance on how the agency plans to review proposals from states that want to deploy their own radio access networks (RANs) rather than having the First Responder Network Authority’s (FirstNet) partner do so. Among other things, NTIA said that greenfield builds are unlikely to be approved because they would not demonstrate cost effectiveness, and it said it might reduce grant awards to take into account cost increases that FirstNet will face as a result of states building their own RANs. The FCC’s Public Safety and Homeland Security Bureau today officially announced that the Federal Emergency Management Agency, in collaboration with the Commission, plans to conduct a nationwide test of the Emergency Alert System (EAS) on Sept. 28 at 2 p.m. EDT. A secondary test date has been set for Oct. 5, if necessary. The national test will be the second such test ever conducted. A new Colorado law has created an Auxiliary Emergency Communications (AuxComm) Unit within the state’s Division of Homeland Security and Emergency Management (DHSEM). The law implements recommendations in a 2012 FCC report to Congress regarding amateur radio’s role in disasters and emergencies. Governor John Hickenlooper signed the measure into law on June 6, 2016. Colorado’s General Assembly determined “a uniformly trained and credentialed unit of communication volunteers available for disaster response” would “materially assist emergency preparedness and disaster response efforts across the state.” “While maintaining their traditional roles as Amateur Radio operators, many of these volunteers assist with the establishment and maintenance of communication facilities, assist with programming public safety radios during emergencies, and act as radio operators on public safety channels,” the bill says in its findings. Colorado Section Emergency Coordinator and State Government Liaison Robert Wareham, N0ESQ, an attorney, conceived this law while he met with DHSEM staff after completing the Office of Emergency Communications (OEC) Auxiliary Emergency Communications course in 2012. In 2012 and 2013, Colorado amateur radio operators played key roles in responding to major disasters in Colorado, including wildfires that destroyed several hundred homes and a 500-year-flood that inundated much of north-central Colorado. While the new law is clear that the unit is comprised of unpaid amateur radio volunteers, it authorizes reimbursement of their reasonable and necessary expenses. It also broadens the circumstances under which any disaster volunteer could receive Workmen’s Compensation benefits and tort immunity in Colorado. “This statute puts volunteer Amateur Radio operators on an equal footing with volunteer firefighters and other rescue workers with respect to legal benefits and protections,” American Radio Relay League (ARRL) Rocky Mountain Division Vice Director Jeff Ryan, K0RM, said. This new Colorado law can be found here. Michigan: Governor Rick Snyder cited Amateur Radios voluntary community service and its role in emergencies and disasters. Minnesota: Governor Mark Dayton proclaimed that during times of national, state, and local emergency, and for community and public events, amateur radio operators have provided communications resources at no cost. Texas: Governor Rick Scott said that amateur radio provides a critical communication link in the event of a disaster and recognizes the support Florida radio amateurs provide in times of emergencies. “AUXCOMM” is an umbrella term and acronym for “auxiliary communications.” It was developed by OEC in 2009 with the assistance of amateur radio subject matter experts. The concept behind the acronym was to educate as many amateur radio entities to work and train with public safety personnel, understand the value of the National Incident Management System (NIMS) Incident Command System (ICS) concept and the role of the communications unit leader (COML). AUXCOMM, although not an official national ICS position as of yet, is most often identified as a Technical Specialist (THSP) in the Communications Unit of the NIMS ICS structure. A few states have endorsed AUXCOMM as an official position within their state NIMS/ICS structure. The process on how this can be accomplished is described in the FEMA NIMS: Guidelines for the Credentialing of Personnel, August 2011 and FEMAs Type 3 All-Hazard Incident Management System Qualification Guide, dated September 2010. OEC subsequently developed the AUXCOMM technical assistance workshop and produced the Auxiliary Field Operators Guide. This guide and other OEC products are available at http://www.publicsafetytools.info/. The TRG-AUXCOMM (again, another Federal acronym for the course designator) is designed to educate amateurs and state officials involved with volunteer groups they could expect in an emergency operations center environment. The AUXFOG is a reference guide for the amateur radio emergency communications community. To date, the OEC AUXCOMM course has been taught 105 times with over 1,300 amateur radio operators trained. Note: Some of the details in this article have been adopted from the ARRL E-Letter, found at http://www.arrl.org/news-features.